One easy way to connect to the internet using a dial-up account is to buy a USB modem which the manufacturer describes as “Linux-compatible”. 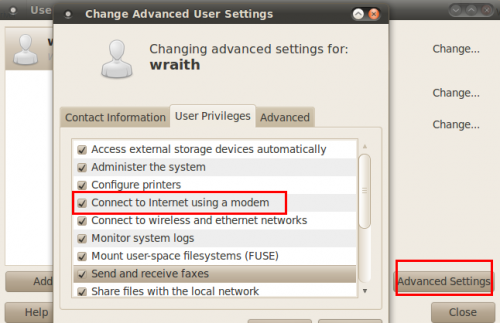 3.Now,plug in your external (USB) Linux-compatible modem.Then open Gnome-PPP from Applications -> Internet menu.Click on Setup,click on Detect (Gnome-PPP will then detect the modem),after detection close the box,and enter your connection information such as login,password,local telephone number of ISP an so on. Finally click Connect.When connection is established,open your browser and surf! To end the session and exit,close the browser and click Disconnect. 8 users responded in " Dial-up Internet Access With A USB Modem in Ubuntu "
when (using gnome ppp) ,click on Detect it shows no modem is detected. I m using huawei ETS 1220, with product id 12d1 and vendor Id 1010. It wait for a few second and then disconnected. I had the same problem after my son set me up. I solved it by doing the following if you have done this you may want to check it. I thought my son did everything but found this step was not done or done wrong. System-> administrator -> user groups then access advance settings -> open user privileges tab make sure everything is checked especially connect to internet using a modem and use modem. I found that the modem connect part was not checked as soon as I checked that part I was up and running on the internet. The cool part of this is that it shows you how long you are on the internet. I’m going to do this for my desktop since I put Ubuntu on there I haven’t found a way to get on the inernet. Hopefully I will do it correctly and get on. my usb modem from tata photon+ is not detected in ubuntu 11.04 .then what is the most easy methord method for this connection . I have tried wvdial and KPPP. I’m a first time user of Linux. And I’ve recently replaced my existing Windows with Ubuntu 11.04. Now I’m trying to connect to the internet via my Samsung mobile. I’ve BSNL as my service provider. Could you please tell each step how to do it because I tried to connect using the GPRS/3G modem option in Network Connections tab but it says unable to connect. How can I configure an usb modem for automatic connection at startup. If my computer will be restarted, I want that my usb modem to make automatically connect on ubuntu.